A senior Pakistani official recently issued a largely ignored statement about the environmental impact of status quo between the armies of Pakistan and India on the world’s highest battleground, the Siachen Glacier. Some military check posts on both sides here are as high as 21,000 feet above sea level. Presence of Indian forces on Siachen Glacier, is harmful to the environment, said Sartaj Aziz, Advisor to Prime Minister Nawaz Sharif on National Security and Foreign Affairs. “Pakistan is facing a water shortage and Indian forces are damaging one of the largest sources of water to Pakistan on a regular basis‚” state-run Radio Pakistan quoted Aziz as saying. He referred to the large-scale disposal of garbage and sewage by thousands of Indian soldiers that, he said, was detrimental to the glacier. Aziz’s statement may or may not be political but deserves more attention in both the countries for Siachen, also called Third Pole in the scientific community, is one of the largest sources of freshwater for the two sides. Located near Karakoram Pass, the 76 kilometer (47.2 miles) long glacier of over two trillion cubic feet of ice is considered the largest in the world outside the Polar region. It is claimed by both India and Pakistan. Geographically it is an unmarked snowy Himalayan wilderness near the two countries border witch china. Its melting ice is the main source of the Nubra River in Indian controlled Ladakh, which drains into the Shyok River. The Shyok in turn joins the Indus River, which serves as a lifeline for Pakistan. The Indus Basin is the 12th largest basin in the world. The geographic layout of the area is such that it slopes towards the south and southwest. Therefore speedy melting of the Siachen Glacier increases the chances of flooding the Indus Basin and causing destructive snow avalanches on both sides of Saltoro Ridge. The glacier saw militarization in 1984 when Indian army sneaked into the area and occupied strategic heights, claiming the glacier to be part of its territory. It sparked a response from Pakistan, which sent its forces and reclaimed some of the area during intermittent heavy fighting spanning over almost two decades. But India still controls much of the glacier. The three-decade long military engagement has produced few results for either side. The stalemate since 2003, when the two sides agreed to a ceasefire, has pitched the two armies less against each other and more against the nature. The two sides have lost more men to nature than the combat itself. Environmentalist on both sides have for long warned that global warming and the conflict are speeding up the melting of glaciers in the region, causing massive floods and depleting their largest fresh water resources. Troops on both sides have played irrevocable havoc with the region’s biodiversity, ecology and hydrology, says Arshad H. Abbasi, former director of the Planning Commission of Pakistan and now advisor to the Sustainable Development Policy Institute, a policy-oriented, research institute based in Islamabad. He says the glacier has reduced dramatically during the last 25 years and is retreating three dimensionally, thinning vertically at an alarming rate, as well as retreating horizontally, at approximately more than 100 meters per year. In an opinion article in a leading Pakistani daily in April 2012, Abbasi referred to different studies conducted by independent groups that confirmed the shrinking Siachen, rising temperatures in Leh, Srinagar and other parts of Indian administered Kashmir and dipping temperatures in the Gilgit-Baltistan province of Pakistan on the other side of the glacier, which till recently was part of Pakistan administered Kashmir. Not just that, the mass of major glaciers, such as the 62 kilometer (40 miles) long Baltoro Glacier, in Gilgit-Baltistan is also increasing. The region’s changing weather patterns are blamed for many recent natural calamities such as the death of 140 Pakistani soldiers on April 7, 2012, when an avalanche hit an army camp at Gayari near Siachen and the 2010 floods that devastated much of Pakistan. The floods, worst in a century, killed over 2000 people, marooned over one-fifth of the country and damaged the country’s tattering economy to the tune of tens of billions of dollars. India too has seen unusual weather patterns in recent years. But the two countries are still not convinced that military conflicts harm delicate environmental balances and are against their national interests. The two countries are also less prepared to meet the climate change related disasters. Pakistan in particular has done little to modernize its water management, stop human encroachment on its waterways and build new reservoirs to conserve water, especially flood water. It might have escaped much of the destruction during 2010 floods, if it had more water storage capacity and less human encroachment in natural waterways. The country is on the verge of officially becoming water deficient and could see massive water shortages within the next two decades. Pakistan’s federal or provincial legislatures have so far done little to preserve the waterways. Controlling human encroachment on scenic waterways has never been popular in Pakistan. It may not thus be forthcoming in the foreseeable future for it’s not politically popular. Pakistan has built no large reservoir in the past four decades, since the completion of Tarbela Dam in 1974, largely because of lack of political will and consensus. It has one of the worst water storage capacity in the world — at pathetic nine percent against India’s 33 percent. Limited storage capacity, few major water reservoirs in the pipeline and an old and crumbling water management infrastructure put Pakistan at greater risk of a disaster in case of an unusual weather activity. Any increase in floods will wash away topsoil, increase desertification, decrease food production and push the economy further into tailspin. Pakistan and India don’t have much time to save one of their greatest freshwater resources. Both have to better prepare for the their emerging common enemy by conserving water, improving their water management and ending humanly-induced climate change by demilitarizing the Siachen Glacier. Sartaj Aziz has a point, which deserves more serious approach from both sides before it is too late. Additionally, Thomas Fingar, chairman of the National Intelligence Council, testified to the U.S. Congress that climate change will exacerbate poverty and increase social tensions, leading to internal instability and conflict, and giving parts of the global population additional reasons to migrate.The Pew Charitable Trust’s Climate Security Project came to the same conclusion: U.S. national and international security is inextricably linked to global climate change. The project’s experts warn that climate change will increase resource conflicts within and among countries, increase migration pressures on hundreds of millions of people, increase the number of humanitarian disasters, disrupt economies all over the world, and threaten military preparedness. Recent disasters in South Asia demonstrate what could be a more frequent reality for the region. Floods in September 2012 displaced 1.5 million people in the northeastern state of Assam, while Cyclone Aila in 2009 displaced 2.3 million people in India and almost 850,000 in Bangladesh. The Asian Development Bank 2012 report “Climate Change and Migration in Asia and the Pacific” concludes that while uncertainties exist on where, how, and how many will be displaced by climate change impacts, it is imperative to begin aggressively examining emerging climate challenges to avoid future complex crisis scenarios. The extreme vulnerability of South Asia raises concern of potential changes and increases in both internal and international migration across the subcontinent. In areas of existing conflict in South Asia, added stressors of climate change and changing migration patterns could be a security concern. The United States has the opportunity to build a vital partnership with countries in the region to mutually cope with climate change. Hurricane Sandy, a record breaking year of drought, heat waves, and extreme weather proved that potential impacts of climate change are not problems of distant shores; they are a globally shared burden. The United States has much to learn and offer in the way of best practices as climate change worsens in the decades to come. Large cities in the United States, such as New York and Miami, will be hit hard with extreme weather in very similar ways as South Asian megacities such as Dhaka and Mumbai. Partnering with India and Bangladesh in complex climate scenarios is smart policy and smart diplomacy for the United States. But in order to do this, the United States needs to understand the factors playing out on the ground. Here the role of climate change, migration, and security are broadly examined at the national level in India and Bangladesh-and then zero in more closely on northeast India and Bangladesh to demonstrate the interlocking problems faced by the people there and writ larger across all of South Asia. As discussed in our framing report, “Climate Change, Migration, and Conflict,” we do not assert direct causal relationships between climate change, migration, and conflict. Instead, we understand climate change, migration, and security as three distinct layers of tension and assess scenarios in which the three layers will overlap. The Indian border state of Assam is a case study on where the three factors converge. 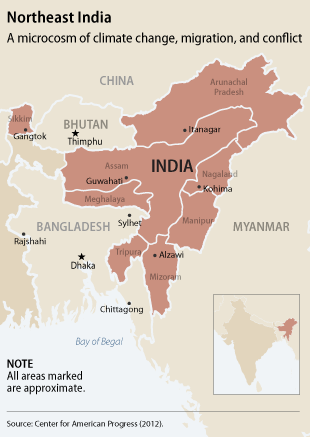 Assam is located in the northeast region of India, connected to India by a land bridge called the Siliguri corridor, which measures less than 25 miles across. The states in the northeast region are collectively called the Seven Sisters and their cultures and traditions are influenced by greater India as well as bordering Southeast Asia. The consequences of climate change on both sides of the border, existing political issues with migration, and conflict that has plagued the region make Assam a unique case study into the intersection of climate change, migration, and security. Deteriorating environmental conditions could increasingly influence decisions to move, in addition to social, political, economic, and demographic drivers. Suddenonset and slow-onset climate change events could spark migration in both India and Bangladesh. 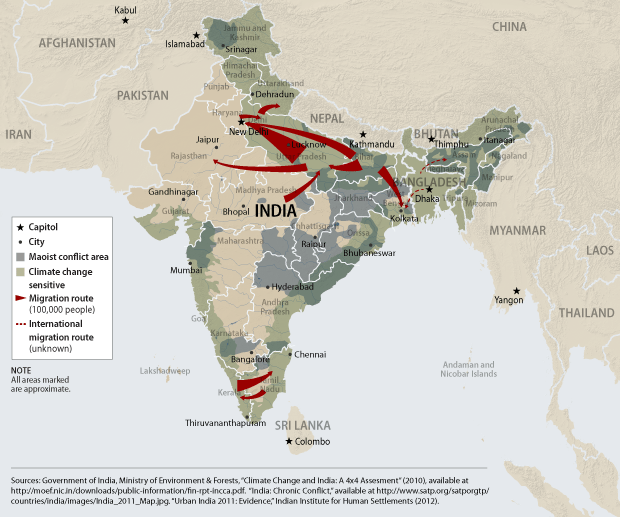 Sudden-onset events-such as flooding, cyclones, and storm surges-could displace millions of inhabitants within short periods of time, as recent events in India and Bangladesh demonstrate. Slow-onset events-such as changes in precipitation, sea level rise, and land erosion-could have detrimental impacts on key economic sectors-such as agriculture, fishing, and tourism-influencing someone’s decision over time to move for greater economic opportunity. The internal and temporary displacement of people in this region will probably account for the bulk of migration that takes place in the face of environmental changes and degradation. People may move within country for a couple days, weeks, or months, or even years to a new location before trying to resettle in their home towns and cities. Rural-to-urban migration has taken place throughout India and Bangladesh and could be more sought after if climate change threatens rural livelihoods, particularly in the agriculture sector. No reliable numbers exist on Bangladeshi emigration. But any change in existing migration patterns from Bangladesh into India could have security consequences, particularly in Assam. Back in the 1980s a group called the All Assam Student’s Union began a movement calling for the deportation of all supposed unauthorized Bangladeshi immigrants, asserting that the immigrants were influencing their economy, security, and political system, as well as their local demographic structure. It became known as the Assam movement and lasted until 1985, causing up to 7,000 deaths. More recently, members of the Bodo tribe and the Muslim community clashed in Assam over the building of a mosque. It resulted in close to 100 deaths and the displacement of over 400,000, who fled to relief camps in the area.As the conflict escalated, members of the Bodo tribe and a section of politicians began to blame the incident on the increasing number of unauthorized Bangladeshis in the region. In the following days, rumors spread via text messages and emails that Muslim groups were planning attacks on Assamese residents living in other parts of India, particularly in the southern cities of Bangalore and Chennai. Thousands of people native to the Northeast Indian region boarded overflowing buses and returned to the region. As of October 2012, 133,000 were still in relief camps.In the days following the conflict, many in Assam resorted to public demonstration and protests against unauthorized immigrants from Bangladesh demanding their identification and deportation, similar to the fervor during the 1980s Assam movement. The conflict in Assam caused upheaval across the country, highlighting the issue of unauthorized immigrants, which routinely becomes an issue during elections in Assam. In assessing the security challenges of climate change, Assam provides an example of several factors coming together in a complex way. Climate change will stress existing migration patterns both locally and internationally in Bangladesh. Even more importantly, the perception that there has been an increase in immigrants has the potential to stoke tensions over immigration in Assam. Given the likelihood that large-scale climatic events will strike the region in decades ahead, it is important to grasp how the complex historical and cultural issues associated with migration in the region could play out. As the United States shifts its strategic focus to the Asia Pacific, a clear understanding of climate change and human mobility will be central to development and security goals in the region. The United States and international policymakers will need to understand and prepare for the added stresses and risks imposed by climate change and migration globally. For the international community the extended region located around India, Bangladesh, and the Bay of Bengal represents both an economic opportunity and a massive development challenge. The unique concentration of population will likely play a pivotal role in coming decades-India and Bangladesh must chart a path of sustainable development by which the region can achieve economic growth while maintaining long-term stability. These three collaborations are detailed further in the conclusion of the report, but let’s briefly examine each of them in turn here. The United States, India, and Bangladesh should lead a high-level workshop on climate vulnerable cities. Cities will be a priority as urbanization continues in India and Bangladesh and as extreme weather challenges the resilience of U.S. urban centers. Cities such as New York, Mumbai, and Dhaka can learn from each other. The goal should be to zoom in and have detailed discussions about resilient infrastructure, disaster relief logistics, and preparedness best practices across countries and government levels. The workshop would be ideally coordinated at a federal level through the U.S. Agency for International Development and the U.S. Department of State with governor and mayor level participants. New York City Mayor Michael Bloomberg and New York Gov. Andrew Cuomo could be in workshop discussions with Mumbai Mayor Sunil Waman Prabhu and Maharashtra’s chief minister Prithviraj Chavan as leaders of two cities vulnerable to sea level rise and extreme weather. The United States and India share numerous concerns about undocumented residents and immigration including social inclusion, path to citizenship, language, cultural differences, deportation issues, border management, and legal status. Comprehensive immigration reform is likely to be tackled in the next four years of the Obama administration. An open exchange between India and the U.S. on immigration would be beneficial to both sides. Ecological infrastructure involves using natural landscapes and ecosystems for the benefit of society. In the case of climate change, natural landscapes that mitigate the consequences of flooding, water salinization, and erosion may be both cost effective and more resilient than traditional infrastructure, such as levies and pumps. Residents of India and Bangladesh have been innovating ecological infrastructure due to lack of formal structures in many areas. As in the cases of city adaptation and immigration, a U.S. partnership with India and Bangladesh on ecological infrastructure would create a rich depository on adaptation strategies while informing U.S. diplomacy and development programs on the ground. Analyzing South Asia through the prism of climate, migration, and security in Assam and the surrounding region provides useful insights into the underlying trends shaping the entire region and the risks posed by current long-term trajectories. While the precise influence of climate change on migration is still the subject of scientific inquiry and debate, the range of issues facing the region calls for a comprehensive assessment of climate change, migration, and their impact on both traditional and human security. We hope the assessment will be a jumping-off point for more empirical research establishing the realities of climate driven migration in South Asia. This article was first published on Center for American Progress website.